Hey hey! More Frozen stuff! 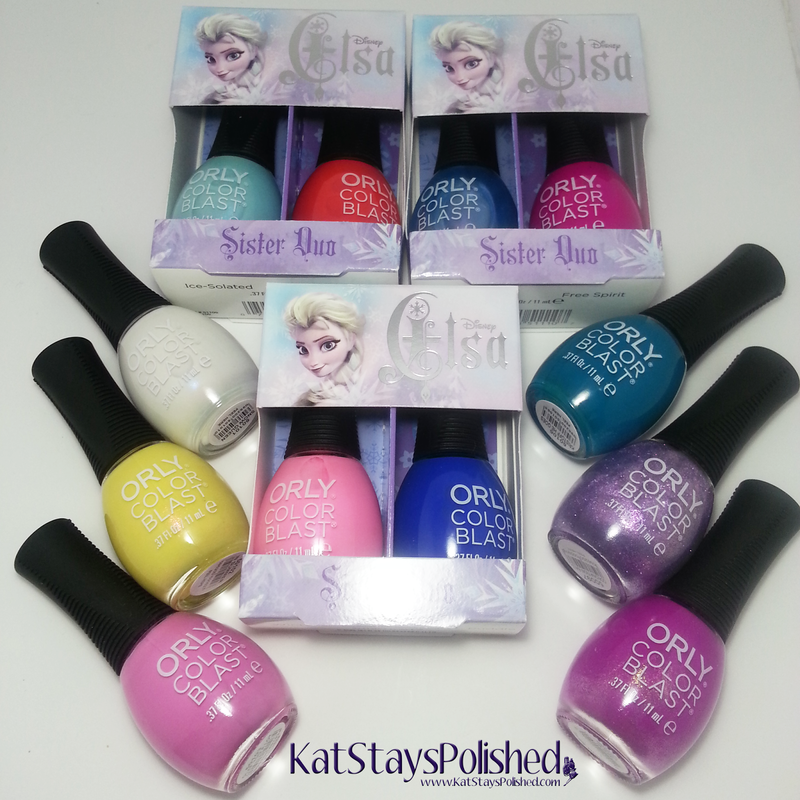 This time it's the Orly Color Blast Elsa collection. I first saw this on Cosmetic Sanctuary's blog. When she mentioned that they were available at Walgreens, I immediately ran to the one by work. I also checked the one by my house and NOTHING. Weeks later, I revisited the one by my house for something else and BAM! There they were! I had to have them. Check out all of my swatches below! Okay, so before I begin, I want to point out that these polishes are available in duo packs for $10.99 or individually for $6.99. I was only able to find 3 duo packs - I'm not sure how many are actually available. Okay, now for the actual swatches. Here is Winter Blush, part of duo pack #1 - a baby pink polish with just a hint of iridescent shimmer. This one, for some reason, was the most difficult to apply. Maybe I got a bad bottle, maybe it's the formula - I'm not sure. It *is* super pretty though! This is 2 coats. A Happy...Puddle is the 2nd polish in duo pack #1 (as I'm calling it) and it a very creamy blue polish. This applied with no issues and show with 2 coats, no top coat. Duo pack #2 begins with this beauty called Frozen. It is a soft multi-chrome polish that represents the theme colors of Frozen just perfectly. This is 2 coats but could probably be completely opaque in 3. Free Spirit completed the 2nd duo pack. This is a super bright fuchsia cream shade and is perfect for summer. This shade will definitely knock your socks off! The last duo pack starts with Ice-Solated. This is an icy blue shade with shimmer and iridescence. This is 2 coats and would be completely opaque in 3. Warm Hugs is a fiery red-orange cream shade and is also quite appropriate for the upcoming warm months. I had no application issues and this is showing 2 coats. Olaf You a Lot is a sweet bubblegum pink with subtle notes of purple. It just screams "love" doesn't it? This is 2 coats. Snow Queen is this fabulous marshmallow-y iridescent white shade. As i was applying it, I imagined it to be sweet marshmallow fluff on my nails. This is 2 coats - I'm in love with it! In Summer is a bright and sparkly yellow shade. Again, yellow polishes can be quite a challenge when trying to apply. This is 2 coats but with 3 you could get it 100% opaque. Coronation Ball is this stunning purple glittery polish that really sparkles in any light. I applied 2 coats to keep that sheer effect going. This applied with ease. Watch Out, or Elsa! This shade has gorgeous flecks of gold shimmer in it and seriously takes your nails to a whole different level. This is 2 coats and it applied so smoothly. When I look at this shade, I think of the beach. Last is Kristoff He Goes. This is probably the creamiest of the collection and it was a dream to apply. Show below is 2 coats. Have you spotted these at your Walgreens stores yet? I know it took a while to make an appearance here on the southern east coast. Let me know if you've picked up any and which ones you love the most! Great swatches of these! Looks like a fun collection. Sephora BeautyBlender "Blenders with Benefit Kit"